It has been seven years since Peter Guralnick attempted his "Listener's Guide To The Blues" and, useful as it was, the book suffered because Peter's personal tastes tended to cloud his objectivity, with the result that certain artists and styles received scant, or no coverage. 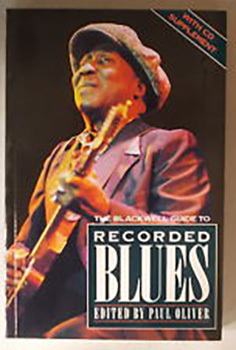 With "The Blackwell Guide To Blues Records" Paul Oliver has attempted to redress this problem by getting together a team "each of whom has a reputation for expertise in a particular branch of the music". Thus we are presented with 12 chapters: "Songsters and Proto-Blues" (Oliver), "Early Deep South and Mississippi Valley Blues" (Evans). "Texas and East Coast" (Bastin), "Classical Blues and Women Singers" (Daphne Duval Harrison), "Piano Blues and Boogie Woogie" (Rowe), "The 1930s and the Library of Congress" (Cowley), ”Rhythm and Blues" (Penny), "Post-war Chicago and the North" (Garon), ”Down Home Post War Blues" ' (Groom), "Post-war Texas and the West Coast" (Shurman), "Louisiana, New Orleans and Zydeco" (Broven), "Soul Blues and Modern Trends" (Hannusch). An impressive roster, each having the unenviable task of selecting 10 "essential" albums, discussing them in some depth, together with a further 30 "basic" records, all of which have to be concisely appraised in five or six lines. One area of blues that has always been a total anathema to me has been the Forties/ Fifties "honking and farting" variety (Louis Jordan I can cope with - Todd Rhodes, Jack McVea - forget it). To "test" the guide I began with relatively newcomer Dave Penny's chapter and a mind that was far from open. Thirty pages later I found myself admitting that - even though I can't abide the genre, perhaps it does have an importance in the development of blues and perhaps I should give some of the cited records shelf space. The other contributors are long standing blues critics/journalists, but who is Daphne Duval Harrison? From her brief biography we learn that she's Professor and Chair of the Department of African American Studies at University of Maryland. The mere mention of an academic is usually enough to deter me from further reading but her chapter on women singers is evocative and knowledgeable with out being gushing or sentimental (traits that raise their heads from time to time within some areas of the guide) and her summation of Bessie Smith's "Any Woman Blues" actually made me play the record. Likewise, one of her "basic" choices is a Dinah Washington record on Mercury. Washington is someone for whom I've no more time than an EP's worth, but Duval Harrison's six line commentary convinces me that it's about time I gave Dinah Washington another chance. Also I'm now kicking myself for not buying Daphne Duval Harrison's "Black Pearls: Blues Queens of the 20s" when I had the chance! So on several different levels the guide at least "worked" for me. Some contributors find themselves in the invidious position of recommending records that they themselves have produced or leased. For example, Bruce Bastin's chapter on "Texas and East Coast Blues" contains 12 records that Bruce has released on his own record label. At first glance this might smack of "vested interest" but it is perhaps worth remembering that had Bastin not used his knowledge of Texas and East Coast blues to compile and release the material, there would be very few "essential" and "basic" records for any of us to buy. It could be argued that Paul Oliver might've looked to another expert (who has Bastin's breadth of knowledge though?) but I'm sure the choice would've been similar, if not identical. John Cowley is faced with the selfsame dilemma concerning the Library of Congress series he compiled and annotated for Matchbox, but I would voice the same in his defence. Cowley, incidentally, peppers his critiques with tantalising book references (Mary Wheeler “Steamboatin' Days"?) most of which fail to appear in the main bibliography. I wish there were time and space to discuss each chapter individually because many thought provoking issues are raised and interesting choices made but the question to be answered is, does the book succeed in its stated aim "to meet an obvious need: a clear indication of the best examples of blues records in each of a number of broad categories"? (Oliver in his introduction). By comparison with what has gone before I think the answer has to be that it does. The writing is largely concise, objective and informative and the selections sensible but, as Oliver notes, this latter area was a minefield for he and his team, and one I'm not going to set foot on in this review. However, there are the occasional choices with which I would take issue, like an album that was released in the UK in 1963, deleted a few years later and is totally extinct apart from occasionally appearing on auction lists at silly prices. Or a Snooks Eaglin "Bluesville" album which is even older - Storyville SLP 140 with similar material is at least still in catalogue (I've checked). The "seasoned fan" within whole-heartedly concurs with the sentiments governing these particular choices but the pragmatist says that the records must, at best, be reasonably accessible otherwise the guide loses credibility. However, this is nit-picking, as I would hope that the majority of users of this guide will not be the likes of me but those who have recently discovered the music and will use it to build their collection. Therein lies another irritation. Each record mentioned is given a consecutive number which I assumed was intended to aid the novice since any one artist can have different albums in several chapters depending on the material (B.B. King a case in point). Therefore, if your knowledge of areas or styles is limited records could, in theory, be located either by title or artist, via a reference number index. But not so. To discover which B.B. King records are covered by the guide one has to plough through his numerous index entries, somewhat defeating the object of the exercise and exasperating me in the process. I pity the poor novice trying to see if particular albums on a mail order list feature in the guide, especially the various artist compilations! The one inherent problem with all works of this nature is that they are constantly trying to hit a moving target. The speed at which today's blues records are released, deleted or even totally abandoned in favour of the compact disc could render this guide out of date in no time at all. Let's hope not because the "Blackwell Guide to Blues Records" fills a long standing gap and, minor carping apart, it is a reference book all readers of this magazine should possess. All credit to Paul Oliver and his team for attempting the near impossible and coming up with the invaluable. Now, who's game to do a "Guide to Essential Blues Compact Discs"? Sneer at your peril, the current generation of blues fans will, before too long, have little time for dinosaurs like the Long Playing Disc, you mark my words!